Meaningful funerals do not just happen. They are well-thought-out rituals that, at least for a day or two, demanding your focus and time. Planning may feel less burdensome if you keep in mind that the ceremony will help you, your family and other mourners embark on healthy, healing grief journey. You have the right to make use of ritual. The funeral ritual does more than acknowledge the demise of someone loved. It helps provide you with the support of caring people. It is a way for you and others who loved the person to say, “We mourn this death and we need each other during this painful time.” If others tell you that rituals such as these are silly or unnecessary, don’t listen. You have the freedom to plan a funeral that will meet the unique needs of your family. While you may find comfort and meaning in traditional funeral ceremonies, you also have the right to create a ceremony that reflects the unique personality of your family and the decedent. Do not be afraid to add personal touches to even traditional funerals. You have the freedom to ask friends and family members to be involved in the funeral. For many, funerals are most meaningful when they involve a variety of people who loved the decedent. You might ask others to give a reading, deliver the eulogy, play music or even help plan the funeral. You have the freedom to view the body before and during the funeral. While viewing the body is not appropriate for all cultures and faiths, many people find it helps them acknowledge the reality of death. It also provides a chance to say a final farewell to the decedent. There are many benefits to viewings and open casket ceremonies; don’t let others tell you this practice is morbid or wrong. You have the freedom to embrace your pain during the funeral. 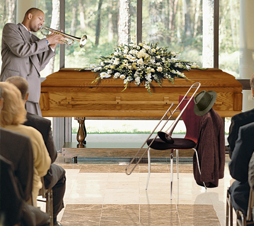 The funeral may be one of the most painful but also the most cathartic moments of your life. Embrace the pain and express it openly. Do not be ashamed to cry. Find listeners who will accept your feelings no matter what they are. You have the freedom to plan a funeral that will reflect your spirituality. If faith is a part of your life, the funeral is an ideal time for you to uphold and find comfort in that faith. Those with more secular spiritual orientations have the freedom to plan a ceremony that meets their needs. You have the freedom to make use of memory during the funeral. Memories are one of the best legacies that exist after the death of someone loved. You will always remember the funeral. Ask your officiator to include memories from many different people in the eulogy. Create a “memory board” or a “memory table.” Ask those attending the funeral to share their most special memory of the decedent. You have the freedom to be tolerant of your physical and emotional limits. Especially in the days immediately following the demise, your feelings of loss and sadness will probably leave you feeling fatigued. Respect what your body and mind are telling you. Get daily rest. Eat balanced meals. You have the freedom to move toward your grief and heal. While the funeral is an event, your grief is not. Reconciling your grief will not happen quickly. Be patient and tolerant with yourself and avoid people who are impatient and intolerant with you, before, during and after the funeral. Neither you nor those around you must forget that the demise of someone loved changes your life forever.